Paper summary elbaro ## Task A neural network for classification typically has a **softmax** layer and outputs the class with the max probability. However, this probability does not represent the **confidence**. If the average confidence (average of max probs) for a dataset matches the accuracy, it is called **well-calibrated**. 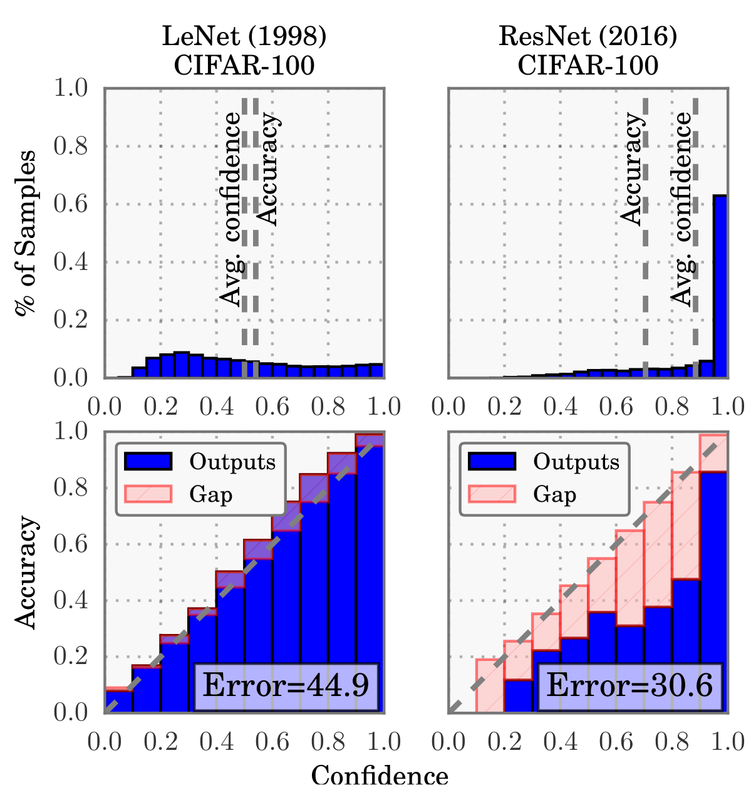 Old models like LeNet (1998) was well-calibrated, but modern networks like ResNet (2016) are no longer well-calibrated. This paper explains what caused this and compares various calibration methods. ## Figure - Confidence Histogram https://i.imgur.com/dMtdWsL.png The bottom row: group the samples by confidence (max probailities) into bins, and calculates the accuracy (# correct / # bin size) within each bin. - ECE (Expected Calibration Error): average of |accuracy-confidence| of bins - MCE (Maximum Calibration Error): max of |accuracy-confidence| of bins ## Analysis - What The paper experiments how models are mis-calibrated with different factors: (1) model capacity, (2) batch norm, (3) weight decay, (4) NLL. ## Solution - Calibration Methods Many calibration methods for binary classification and multi-class classification are evaluated. The method that performed the best is **temperature scailing**, which simply multiplies logits before the softmax by some constant. The paper used the validation set to choose the best constant. Guo, Chuan and Pleiss, Geoff and Sun, Yu and Weinberger, Kilian Q. A neural network for classification typically has a **softmax** layer and outputs the class with the max probability. However, this probability does not represent the **confidence**. If the average confidence (average of max probs) for a dataset matches the accuracy, it is called **well-calibrated**. Old models like LeNet (1998) was well-calibrated, but modern networks like ResNet (2016) are no longer well-calibrated. This paper explains what caused this and compares various calibration methods. The bottom row: group the samples by confidence (max probailities) into bins, and calculates the accuracy (# correct / # bin size) within each bin. The paper experiments how models are mis-calibrated with different factors: (1) model capacity, (2) batch norm, (3) weight decay, (4) NLL. Many calibration methods for binary classification and multi-class classification are evaluated. The method that performed the best is **temperature scailing**, which simply multiplies logits before the softmax by some constant. The paper used the validation set to choose the best constant.